Motorized Translation Stage 8MT167-100 is designed on the basis of 7T167-50 translator. The movement is produced by a stepper motor through the reducing gear and a lead-screw. There are 1000 steps per millimeter. Individual units are accompanied by indication of electrical parameters and connection schemes of the motors. The motors have 200 steps per revolution. To drive the motor, we offer a range of controllers. Controllers can drive the motor in 1,1/2,1/4,1/8 step division mode. There are microstepping controllers, available from other manufacturers, which divide a step into 10 parts. Mechanics of 8MT167-100 translation stage can be easily attached to any type of stepping motor or servo motor of your choice. Motorized translation stage motor or controller is available upon request. With the help of a Connecting Plate 2CP167-100 and Angle Bracket 2AB167-50 it is possible to assemble translation stage in two or three coordinates. Reduction gear with a motor constitute a Lead Block of the stage. 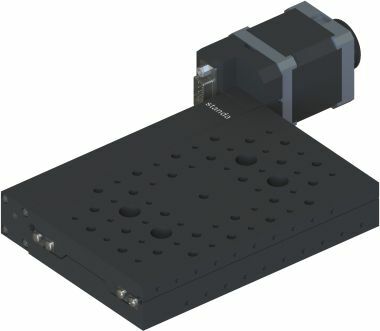 If it obstructs any specific space the lead block of the motorized translation stages may be repositioned on the stage by detaching and replacing it in desired orientation or displacement. See diagrams below. For clear bottom plate surface. For clear top plate surface. At different positions along the axis of the motorized translation stage. Motorized translation stage with stepper motor 28 and connector DB9(M) on motor itself. Motorized translation stage with stepper motor 28. Motorized translation stage with DC motor. Mechanical end limit switches 2, Pushed is "closed"
*After backlash compensation. Backlash compensation value provided with each actuator.